For local info such as places to eat & drink, cash points, etc, click here. 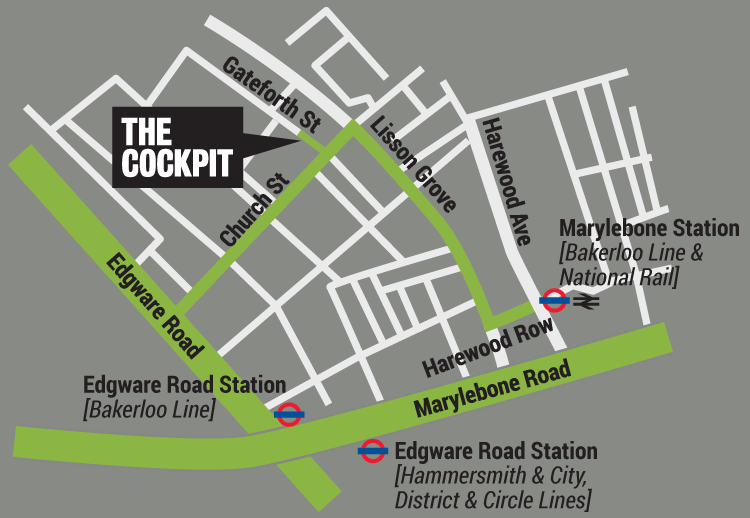 The Cockpit is on Gateforth Street, which is at the north end of Church Street. Church Street runs between Edgware Road and Lisson Grove. The nearest stations are Edgware Road (Hammersmith & City, District, Circle, Bakerloo) and Marylebone (Bakerloo and main line). Both are about a 7 minute walk away. Click here to use the TfL Journey Planner. Leave the main exit and turn right. 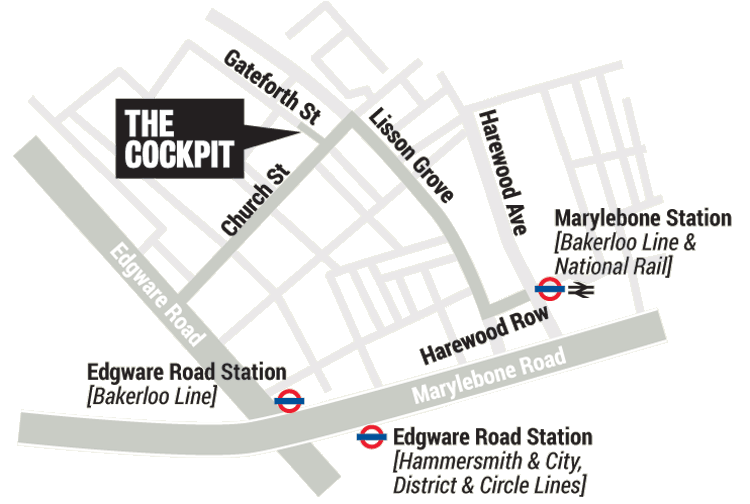 Continue and go straight down along Harewood Row (with the Travelodge on the corner) and you will reach Lisson Grove. Turn right and keep walking until you reach the traffic lights. Turn left onto Church Street and then right onto Gateforth Street. There are two exits depending on which line you arrived on. From the Hammersmith & City, Circle or District platforms, exit the station and walk straight down to Edgware Road (passing the window cleaner statue on your right). Turn right and walk under the flyover. You will be at the Bakerloo Line exit. From the Bakerloo line exit, walk along Edgware Road away from the flyover and take the forth right onto Church Street (it's the first proper crossroads you'll come to). Walk to the end of Church Street and Gateforth Street will be the last turn on the left. Buses stopping nearby are 6, 16, 18, 98, 139, 189, 332, 414. Saturdays - if you are visiting on a Saturday avoid driving if you can. It is difficult, verging on impossible, to get to us or find parking because of the Church Street Market, and as Lisson Grove is the only Pay & Display parking in the vicinity, spaces are extremely limited. Most other streets near us are Resident Permit Holders only (don't take the chance, you will get a ticket). There is unrestricted parking (single yellow line) after 6.30 pm and on Sundays in most local streets and just along from the theatre in Gateforth Street. At other times there is Pay and Display parking available on Church Street (not on Saturdays), and Lisson Grove. There are three disability badge-holder bays directly in front of the Cockpit. Avoid the 'resident only' bays nearby! The Cockpit has a small car park for staff and show vehicles only (call or email to check availability) . We are able to offer all our visitors discounted car parking at Q-park Church Street just a short distance from the theatre. Parking is very easy for central London - but read the signs and don't take chances . The wardens are merciless. We have a bike rack available in our stairwell. We do not accept responsibility for any bikes left here during the day and we ask that no bikes are left overnight. There are Barclays Cycle Hire docking stations at the junction of Church Street and Penfold Street, Marylebone Station, Mallory Street by the Greenside Community Centre, and on Lisson Grove by the canal bridge. We are very near the Lisson Grove basin on the Regents Canal. There is level access to the foyer, bar and foyer toilets but after that it gets tricky. There are six steps down from the foyer to the auditorium. Access to the auditorium is possible for wheelchair users via the car park and rear entrance. Contact us on the day if you can to let us know you are coming. 0207 258 2925 or email reception thecockpit [dot] org [dot] uk and try and arrive a bit early because we like to make sure you are comfortable before we let other audience members into the show. We are only allowed four wheelchair users on the premises at any one time. On the upside there are three parking bays for badge holders bang outside the theatre. For classes/rehearsals/auditions: Our three rehearsal rooms are all upstairs and are currently only accessible via a large spiral staircase. We ask that all toddlers and young children are supervised at all times by a parent or guardian, and for parents to note that The Cockpit is a licensed venue, so evening shows are not suitable for very young children unless clearly indicated as such. We currently have no baby changing facilities, however we are breast-feeding friendly and we are more than happy to look after buggies and push-chairs in the foyer, while you and your family enjoy our childrens' shows - mostly at weekends. Please bring crying or fussy children into the foyer, so as not to disturb the performance. Finally, please watch out for swinging doors around the building, as our fire doors often open in two directions and can be dangerous for tiny fingers.